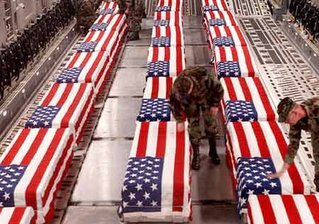 “The anti-war left couldn’t wait for the death of the 2,000th soldier in Iraq,” Malkin incredulously claims in her opening sentence, as if the protest movement’s been silent for the first 1,999 casualties. “Peace activists have been gearing up for protests, vigils and other events this week to mark the completely bogus milestone.” She’s building off the Republican talking point of the week, which is that the number 2,000 is no more or less significant than the 500th soldier to die or perhaps the 3,000th who will in the future. But that’s precisely the point that she and the legions of conservative hawks and neo-cons are missing in the anti-war movement: we do not want anymore soldiers to die. Diehard, delusional hawks like Boylan and Malkin just don’t get it that most of the country is now against the war, and the press’s treatment of it has shifted to the negative as well. Unlike the military elite, we are the ones “thinking about the families and those serving.” We are the ones who think 2,000 grieving families is 2,000 too many, and we do not wish to see even one more. For Malkin to say that the “anti-war left” needs the 2,000 milestone as an “excuse” to protest demonstrates her ignorance over the movement’s increasing popularity and momentum, and is further proof that conservatives like her are grossly out of touch with mainstream America. Worse, relegating the 2,000 dead to a mere political statistic is a dishonor to those who put their trust in Bush and gave their life as a result. The peace movement did not start with the death of the 2,000th U.S. soldier. Those of us against the war have been sounding the alarm for three years now. We saw Bush’s White House Iraq Group (WHIG) gearing up for war as a distraction and diversion from its failure to capture Osama bin Laden, and we never for a nano-second believed that mushroom clouds at the hands of Saddam ever threatened America’s homeland. We knew there was no WMD, no bin Laden/Saddam connections, and no shot of ever seeing a true Democracy in a country that's likely to be run by radical Islamists. We were against the invasion, we lamented the first soldier’s death, and we now see the number 2,000 as a frightening precursor to untold thousands more. And that is why the number 2,000 is so significant. It’s not for what it represents yesterday or today, but what additional horrors it will bring tomorrow unless the U.S. begins to develop an intelligent and timely exit strategy. I also read that 2000 deaths is more than were lost in Vietnam in the first 4 years (1961-1965, just over 1800 died).